We started by installing a full vehicle XPEL Ultimate Plus paint protection film wrap before beginning the audiophile upgrade. FOCAL 4" Mid-Range Drivers were installed in the dash corners and FOCAL 4" 2-way component kit mid and tweet were installed behind the headrests. We installed JL Audio’s FiX-82, a state-of-the-art digital signal processor engineered to deliver world-class sound from factory audio systems, without replacing the OEM source unit. We used a JL Audio ZR650-CSi 2-Way Component System with 6.5-inch (165mm) woofer, the pinnacle of the JL Audio component speaker lineup and designed a custom enclosure for the JL AUDIO TW5v2 13.5-inch Subwoofer Driver, using minimal space while guaranteeing incredible sound. To top it off we used JL AUDIO's VX800/8-channel Class D Full-Range Amplifier, along with JL AUDIO’s VX100/5-channel Class D System Amplifier, both with integrated digital signal processors, which made for outstanding fidelity, very low noise, and exceptional efficiency. 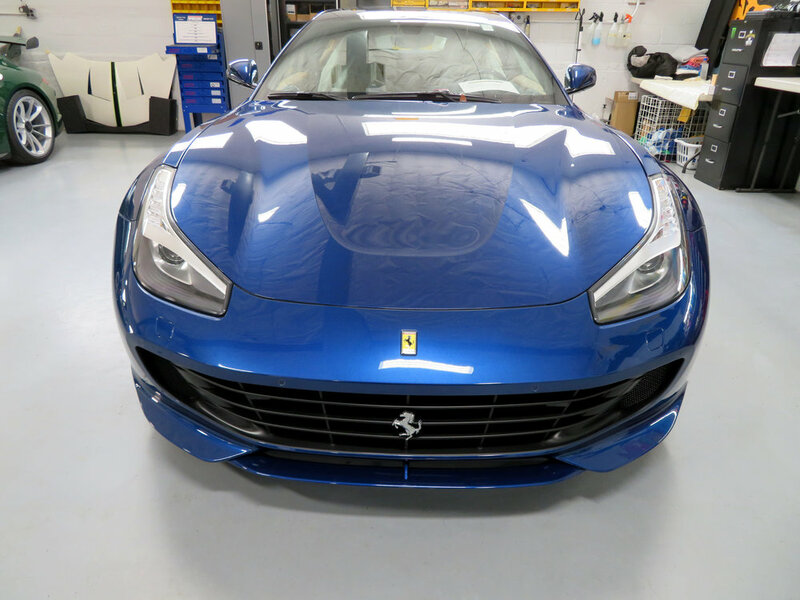 This Ferrari GTC4 Lusso went through a custom paint reconditioning process to prepare the painted surfaces for a complete XPEL Ultimate Plus paint protection film wrap. We removed all of the lower black ground effects and painted them to match the OEM blue color before re-installing them. Front and rear AL Priority laser jammers and NET Radar were installed, including Bluetooth and GPS.